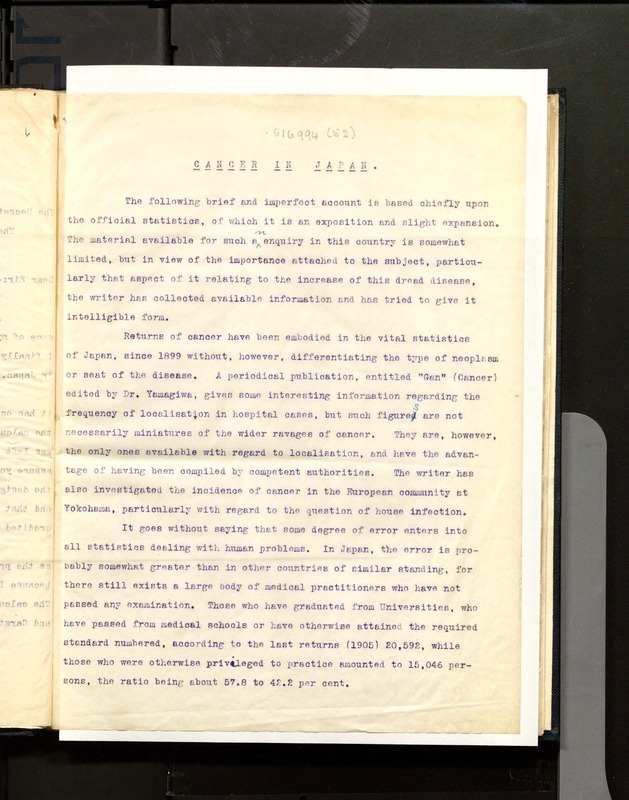 Earlier this year a digital copy of the 1909 thesis of Scottish born anthropologist and physician Dr Neil Gordon Munro was ordered by a museum in Japan. 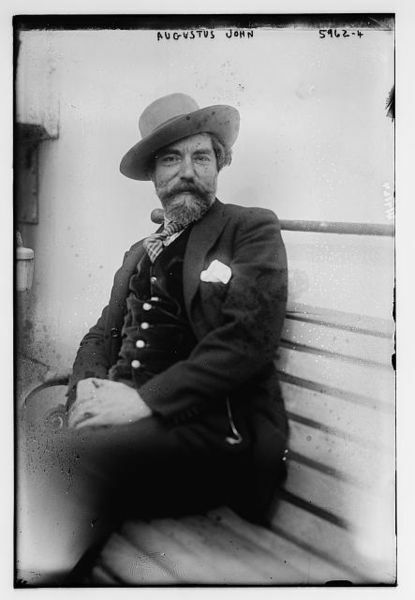 The digitised work will be included in an exhibition at the Yokohama History Museum in the city where Munro lived and worked as director of the General Hospital for much of his career. 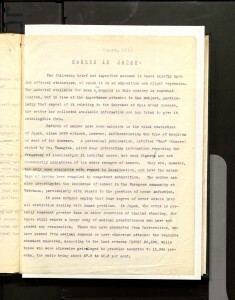 The thesis was challenging to digitise as much of it was typed on thin, see-though carbon paper. Many of the pages had become wrinkled with age and some were handwritten. As the University of Edinburgh begins exploring distance learning tools and deploying courses via Coursera this thesis, submitted from Japan, demonstrates the Universities rich yet largely invisible history of distance learning. 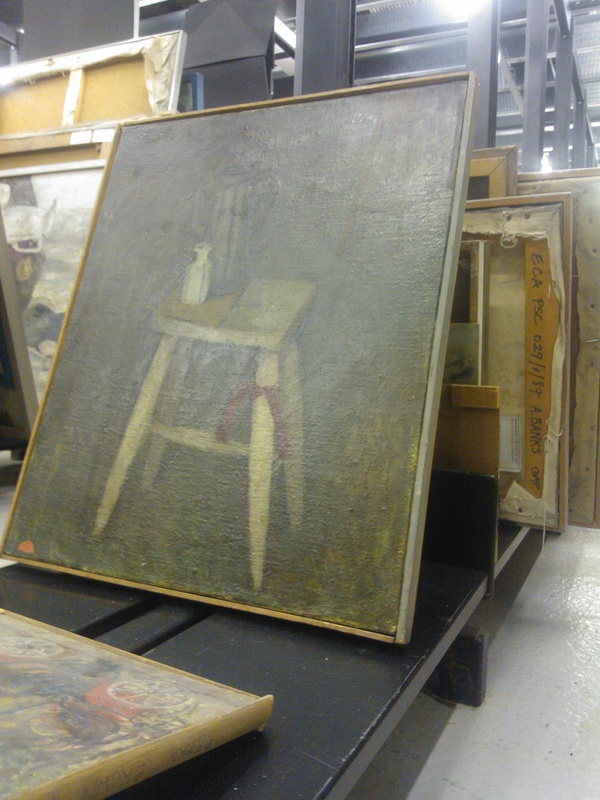 Among the items from the ECA Collection being stored at the Annexe are some stunning examples of British Art that were purchased in the 50s with funding provided by the Carnegie Trust. Including some works by Henry Moore, Barbara Hepworth, and Augustus John. Augustus John poses for the American press on board a ship. Charlie demonstrates our beautiful scanner. 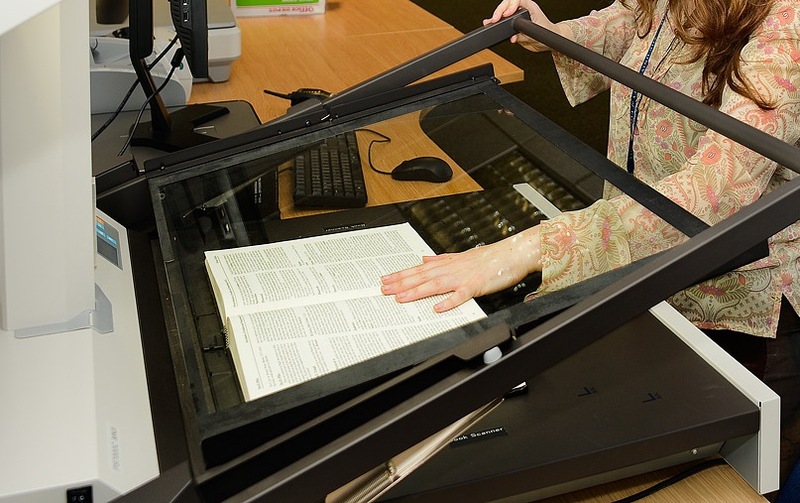 In October 2012 the Library Annexe began operating a new Thesis Scanning Service. The service has proved popular with theses covering topics from historical re-enactment to earthquakes. And if anyone is fluent in Arabic and can tell us what Al-Hajeri’s (2007) 1200 page thesis is about – let us know! Once scanned, a digital copy of the thesis is made available on the university’s institutional repository ERA where they are already seeing increased usage. The eventual aim is to make the entire thesis collection available online. For more information on the service visit the Thesis Scanning Service webpage and to find out more about the University’s online repository check out the research already available on ERA. The Annexe provides a great space to store, sort, preserve and work on collections. Improvements to the storage of materials are always on-going. 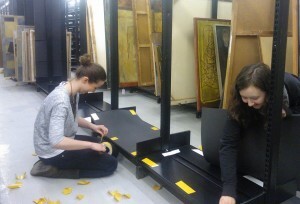 Recently staff from the ECA have been working hard out at the Annexe lining shelves with Plastazote, a hard foam, to protect the paintings. Plastazote is used in conservation for many purposes. It is used for packaging and the protection of various fragile objects and artifacts. Also, to create book rests and display supports. So what is it? Plastazote foam sheets are a high density light weight chemically neutral and inert polyethylene foam material. Catch all of that? This means that the foam is inert and acid free so it won’t react chemically with any conservation material it comes into contact with. The high density foam can be cleanly cut and sculptured to most shapes. Both of these factors make it great for packing archival boxes to fit the object, such as rare books and other valuable items that are subject to potential damage. 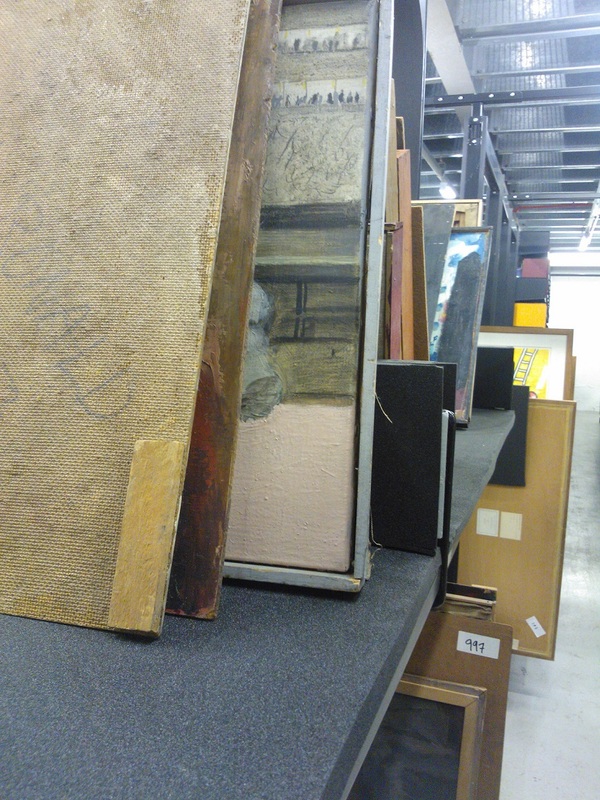 By lining the shelves out at the Annexe, we are creating a more secure, safe, preserving space for the ECA Collection to ensure that the Collection will be in top condition to be enjoyed for many years to come. 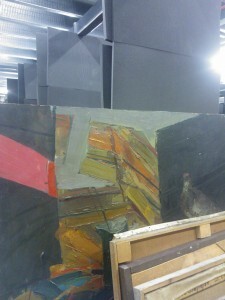 When the Edinburgh College of Art merged with the University of Edinburgh in August 2011, they brought with them a fantastic collection of art and archives. Including a large collection of paintings which were stored off site in Livingston and have now been moved to the Library Annexe. What are these paintings and where do they come from? The vast majority of the ECA paintings at the Annexe are student works from final year degree shows. The additional storage space provided by the Library Annexe has been a boon to the ECA. 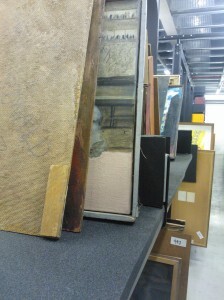 This space allows room for the expansion and growth of the collection. In an exciting move, the ECA will this year re-start acquiring final year student work from the Degree show as part of a purchase prize. If you are interested in art and would like to have a look at what our student’s are creating, the Edinburgh College of Art Degree Show 2013 is currently taking place until Sunday 9 June 2013. Check it out! Don’t fear though, if you miss the Degree show, the ECA Post Graduate Degree Show 2013 will be happening from Saturday 17 August to Sunday 25 August 2013.